W.A. Lewis, The Evolution of the International Economic Order. R. Cooper, Opportunities and Risks for the World Economy: The Challenge of Increasing Complexity. The Secretary-General, United Nations, The World Economy Entering the 1990s. G.M. Meier, Terms of Trade. J.M. Letiche, R.G. Chambers, and A. Schmitz, The Development of Gains from Trade Theory: Classical to Modern Literature. T.W. Schultz, The Allocative Efficiency of Traditional Agriculture. T.W. Schultz, The Economics of the Value of Human Time. D.G. Johnson, The World Food Situation: Developments During the 1970s and Prospects for the 1980s and 1990s. J. Viner, The Economics of Customs Unions. R.G. Lipsey, The Theory of Customs Unions: A General Survey. P. Robson, The Theory of Common Markets. R. Dornbusch, Europe 1992: Macroeconomic Implications. R.F. Mikesell, The Theory of Common Markets as Applied to Regional Arrangements Among Developing Countires. R. Prebisch, The Latin American Periphery in the Global Systems of Capitalism. S. Okita, The Emerging Prospects for Development and the World Economy. R.E. Caves, International Cartels and Monopolies in International Trade. J. Behrman, Simple Theoretical Analysis of International Commodity. H.S. Houthakker, The Ups and Downs of Oil. R.E. Caves, Foreign Direct Investment and Market Performance. R. Vernon, International Investment and International Trade in the Product Cycle. S. Hymer, The Multinational Corporation and the Law of Uneven Development. B. Balassa, The Choice of a Development Strategy: Lessons and Prospects. H. Myint, The "Classical Theory" of International Trade and the Underdeveloped Countries. T.A. Wolf, Foreign Trade in Planned Economies. G. Patterson and E. Patterson, A New Agenda for the GATT. H.B. Chenery and A.M. Strout, International Assistance Policies. P. Krugman, Imperfect Competition, Increasing Returns, and Differentiated Products in International Trade. R.E. Baldwin, The New Protectionism: A Response to Shifts in National Economic Power. A. Fishow, Alternative Approaches and Solutions to the Debt of Developing Countries. J. Meade, The Meaning of "Internal Balance." H.G. Johnson, Money, Balance of Payments Theory, and the International Monetary Problem. R.N. Cooper, Currency Devaluation in Developing Countries. R. Dornbusch, Contemporary Exchange Rate Economics. J.A. Frankel, Monetary and Portfolio-Balance Models of Exchange Rate Determination. A. Giovanni, The European Monetary System. K. Rogoff, Can International Monetary Policy Cooperation Be Counterproductive? J.A. Artus, and A.D. Crockett, Floating Exchange Rates and the Need for Surveillance. International Monetary Fund, How the IMF Provides Financial Assistance to Meet Member Countries' Needs. L.R. Klein, Some Economic Scenarios for the 1990s. The literature on international economics has become excessively specialized. In selecting distinguished readings for this source book--including contributions by Nobel laureates such as Lawrence R. Klein, Arthur Lewis, James Meade, and Theodore W. Schultz--Professor Letiche breaks the mold. 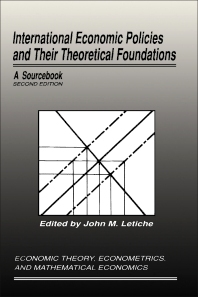 The essays concentrate on interrelation between theory and actual policy design, and this collection of classic pieces and recent economic contributions are a valued resource in universities and government offices. Advanced undergraduate and graduate students in economics.